The Salem Wax Museum of Witches and Seafarers (also known as the Salem Wax Museum) opened in 1993 with a collection of wax figures made in London depicting events from Salem’s history. Back when I first visited Salem in 1997 or 1998, the wax museum had dipped its toes into the world of haunted attractions by opening the “House of Wax” attraction. Sadly, I didn’t get a chance to visit either during my trip, but I did get to visit the haunt two years after it was renamed and rethemed as the “Hall of Illusions” in 2000 (more on that later). In 2004, it was rethemed once again as “Frankenstein’s Laboratory,” which later became “Frankenstein’s Castle” in more recent years. My experience at the Hall of Illusions was…not good. Although I spotted a few giant spiders on the walls while walking down the stairs leading to the haunt, most of the first portion of the haunt was a lengthy dark hallway. Occasionally people would jump out, but there was nothing else going on. There weren’t even any “dark maze”-style scares like putting bits of hose and fake fur on the walls so people think they’re touching snakes and animals. Believe me, I checked. Next was the worst variant of a “dot room” I have ever seen, which is especially tragic given that it was one of the few actual illusions in the haunt. A good dot room places people in an area completely covered in a simple pattern that is only lit by a strobe light. An actor wearing a full body costume and mask matching the pattern slowly moves around the patrons so they get the impression something is in there with them, only to attack once their confusion and fear is at its maximum. Instead, the people behind this haunt opted for a single checkered wall, with the edges clearly marked by old toys and light from the next area streaming in. Making matters worse was the fact the actor in the checkered bodysuit was wearing a clown mask. I think they were shooting for a floating clown head effect, but all it did was make it painfully clear where the actor was at all times. After this was another jump scare and a small area set up with a few dead tree limbs in an attempt to look like a haunted forest. It was a good effort, but was far too small and the chainsaw-wielding maniac’s hiding place was all too easily seen when you entered the room. The path to the exit was another pitch black hallway in which the final illusion of the haunt occurred. When you get halfway through, a laser light show suddenly bursts out of nowhere. It was, in my opinion, the sole good scene in the haunt, which took advantage of the eyes of visitors just getting adjusted to the darkness just before being hit with a light-based surprise (thankfully the laser was mounted well above anyone’s line of sight). If the use of darkness for the bulk of the haunt was done to make the final scare even more unexpected, I would further compliment this as a nice bit of misdirection (albeit with the darkness in the earlier part of the haunt needing better scares). After having gone through some name and theme changes in the years since I visited, I had originally written off the idea of reviewing it as being pointless since the overall experience was probably completely different from when I was there. Hearing numerous negative reviews of the Frankenstein’s Laboratory incarnation being nothing but jump scares did not dissuade me from that view (especially since it sounded like it had gone even further downhill). But after watching a walk-through video of the haunt’s most recent incarnation, I changed my mind. Although the scenes were different, there were some elements of my visit there. Sadly, dark hallways are still part of the haunt and there only seem to be a handful of performers. However the length of the dark parts appear to be shorter now and black lights have been added. It’s not as good as it would be if they added more scares, but it’s definitely a start. The other improvements are much more impressive. See that picture of entrance posted above? That’s technically not the real entrance of the haunt. Going down the stairs now takes you to an awesome skull encrusted doorway that leads to some black light scenes and a detailed graveyard. I was also impressed with the quality of the dungeon room. The quality of scares has also improved. Rather than “jump scares,” the actors use scare tactics similar to those seen at Hanson’s Haunted Farm and Hayride. That said, the performances I saw in the video needed a little work (one especially needing to know when to quit). Although there aren’t any scenes that have a direct connection to Dr. Frankenstein, I do understand that Frankenstein’s monster might appear in the haunt on occasion (but wasn’t in the video I saw). I was surprised by the complete lack of animatronics. Given their small number of actors, one would think such props would be a great way to increase the amount of scares. Someone involved clearly has at least some knowledge of haunted attractions, as their using a strobe light to “liven up” a static scene was an excellent choice. That said, not every static scene has to use strobes. This, combined with the improvements made since the time I visited the haunt have convinced me Frankenstein’s Castle has potential. It turns out I’m not the only one who has noticed the improvements either. As the space it is located in limits the size of the haunt (it takes under 5 minutes to complete) and moving seems unlikely, either additional scares should be added or the price should be lowered in order for me to recommend it more. Adding a hellevator and/or an area filled with dangling objects patrons have to navigate through could help make the overall experience seem longer and give customers more bang for their buck. The haunt’s performers could also control multiple scares and use misdirection in order to create a more intense experience. Why run through a long dark tunnel when eerie portraits or glowing murals could be added? Hell, I’d be happy to offer more detailed advice to the owners if they’re interested. While those reading this in the future should check out whatever haunt the Salem Wax Museum is presenting (I’m sure the current name and theme will eventually change at some point) to see if the attraction has further improved, those interested in a 2013 visit should definitely go for a discount. I’ve heard of people getting a few bucks knocked off the price by presenting their AAA card in the past, but I can’t say for sure if that still works. 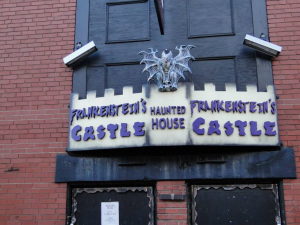 Those interested in visiting the Salem Wax Museum, Haunted Witch Village and “Within the Witch Hour: A Spellcasting” in addition to Frankenstein’s Castle should seek out the “Wicked Special” (assuming your visit is in October), which works like you get to visit four attractions while only paying for about two. No matter when you go, please feel free to let me know what your experience was like. UPDATE: I recently found a new walkthrough video of Frankenstein’s Castle from 2013 and watching it was very enlightening. 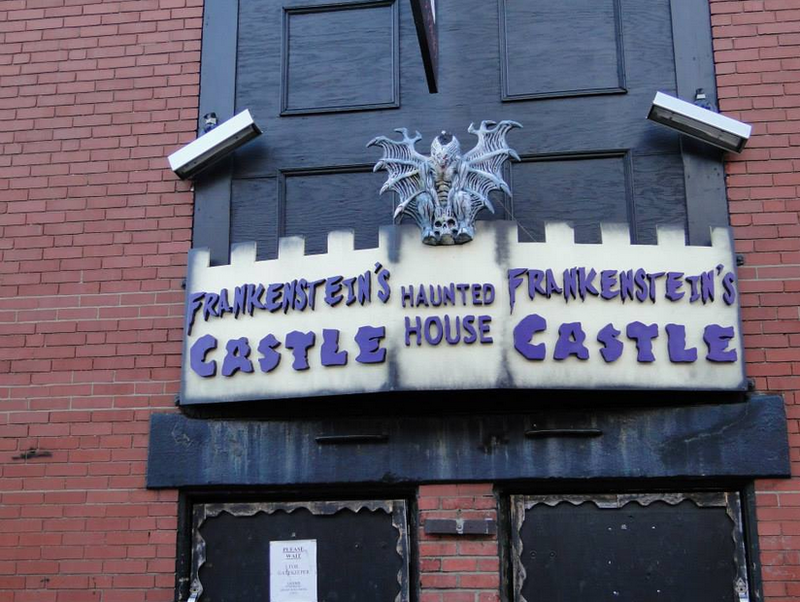 Save for the graveyard and ghost at the beginning (and the heavy use of dark hallways), the attraction was changed for the 2013 season. I can’t say for sure it will change again for 2014 and beyond but it does seem likely. Although there are still some problems (which I will get to later), things have definitely improved. There are now animatronics and misdirection scares, along with spooky music and some scenes which directly tie into the Frankenstein legend! Sadly there are still plenty of standard jump scares and a few scares which are all to easy to predict. I suspect they are using a small amount of people to do multiple scares, which would imply the people behind Frankenstein’s Castle have a good grasp on making the most of a small pool of performers. There seems to have been some effort to cut down on the amount of total darkness, but there’s still lots of of room for improvement. But pure darkness admittedly can have its advantages. The use of sound in one pitch black area was absolutely perfect for building tension. I also recommend making more of an effort to disguise or hide the lighting effects. Visitors should not be able to see black lights or multicolor rotating party balls as they go through the attraction. But let’s not forget how improvements were made and they are on the right track. Even though they still have a ways to go before they get a perfect rating, I’m sure Frankenstein’s Castle will earn one by staying on this track. So I give the 2013 upgrade 2.5 skulls out of 5. Special thanks to Halloween New England for use of the image!